(March 20): Southeast Asian stock markets were mixed in thin trade on Monday, with Indonesia heading for its first fall in six sessions while the U.S. Federal Reserve's dovish stance continued to drag the dollar lower. Indonesian shares fell as much as 0.4 percent following last week's record-setting spree with consumer and energy stocks leading the decline. "I think it's just a bit of profit-taking," said Harry Su, an analyst with Bahana Securities in Indonesia. Indonesia's central bank held its key policy rate unchanged on Thursday, saying it wanted to maintain stability amid global uncertainties. "Last week was a turning point for Indonesian equities. The Federal Reserve made it clear that despite a rate hike, its monetary policy remains 'accommodative'," said Taye Shim, head of research at Jakarta-based Mirae Asset Sekuritas. "Given most foreign investors have large cash positions, we expect to see increased foreign net buying during this week." The dollar slowly ceded ground in Asia on Monday with greenback bulls still nursing grudges after the Fed's rate guidance last week proved to be less "hawkish" than many had wagered on. "The dovish stance of the Fed reignited investor appetite for risk assets, pushing up regional asset prices," said Shim. United Tractors Tbk PT fell 2.3 percent, while Unilever Indonesia Tbk PT dropped 0.9 percent. An index of the 45 most liquid stocks was down 0.4 percent. 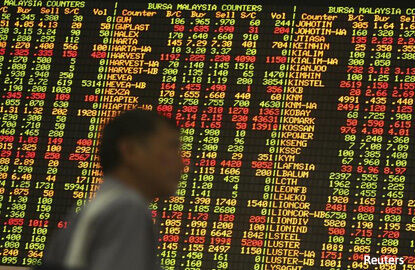 Malaysian shares rose as much as 0.6 percent to their highest in about 22 months. Financials and telecoms led the gains with Malayan Banking Bhd adding 0.9 percent and Axiata Group Bhd gaining 1.6 percent. Singapore was down after two sessions of gains with energy and financial stocks being the biggest drag. Keppel Corp Ltd fell 0.9 percent. Oil prices fell as rising U.S. drilling activity and steady supplies from OPEC countries despite touted production cuts pressured already-bloated markets. Philippine shares slipped, pulled down by financials and utilities, with property developer SM Prime Holdings Inc losing 0.9 percent. "CPI inflation is already above 3 percent, as of February 2017. Demand-pull inflationary pressures remain prevalent in the economy. A gradual policy tightening is forthcoming," DBS Research Group said in a note.